Looking back over my reading this past year, I have to say I’m pretty pleased with the results. Over 15,000 pages read, across 45 books (which is 3 more books, and 1,500 more pages, than in 2017). But it’s not just the numbers I’m pleased about — it’s the books themselves. I read some good books this year, from excellent contemporary fiction (which is not my usual fare) to inspiring memoirs — with quite a few joy-rides thrown in. With only a few exceptions, my reading was enjoyable and thought-provoking (sometimes one or the other, but often both at once) — ranging in topic from bird-watching (A Guide to the Birds of East Africa) to writing (Word by Word) to technology (You are Not a Gadget) to depression (Noonday Demon). If I was forced to group this year’s reading by category, however, the prevailing theme would overwhelmingly be faith. Whether rooted in contemplative tradition (Thomas Merton and Thich Nhat Hanh), Christian heritage (Anne Lamott, Emily P. Freeman, Henri Nouwen, Jan Karon, and Sigrid Undset), or elsewhere (Malala Yousafzai, Cheryl Strayed, Elizabeth Gilbert, and Elif Shafakmore), much of my reading this year was concerned — directly or indirectly — with the question of how one is to know and follow God. Of where the Kingdom of Heaven is to be found. Those that resonated the most strongly invited the reader to encounter the divine in the ordinary, holy moments of their lives — here, in this present moment, one inch above the ground. I’m also proud that, of 45 books read, 20 were written by women. While this is not quite 50%, it’s closer than it could be (closer than it’s often been in the past). Flipping this ratio is one of my goals for 2019 (which is boding fairly well, given that, of the seven books I’ve either completed or begun since January 1st, six were written by women). Shockingly, despite having read a Rainbow Rowell this year, it’s not making it on the list. Attachments was light and fun — the perfect read to buffer transition and dampen jet-lag — but it was a more forgettable version of the normal Rowell magic, and did not, ultimately, leave much of an impression. The winner, therefore, is the Lunar Chronicles by Marissa Meyer. By no means life-changing, this young adult series was just so unapologetically fun (with the noticeable exception of the second book of the series, Scarlet, which left something to be desired). I inhaled these, staying up reading late into the night, despite my work schedule and teaching commitments — something no book had made me do in a long, long time. Thich Nhat Hanh’s The Present Moment: A Retreat on the Practice of Minfulness. It would be hard to overstate the impact this audio-recording had on me. It was enlightening in the deepest sense of the word — a door swinging open onto life, and life abundant. Though I’ve listened to some Thich Nhat Hanh in the past, this (in combination with a first-hand account of his lived reality, as told by Sister Chan Kong at the end of Hanh’s novel The Novice) clicked for me in a new way, and I suddenly get what all the fuss is about. Runners up: Cheryl Strayed’s Wild — which was beautiful, powerful, life-affirming, and among the best nonfiction reads of the year — and Malala Yousafzai’s I am Malala — which was educational and inspiring. I read several amazing novels this year, but I have to give this honor to Stephen King’s The Gunslinger. Not a fan of horror, the only King I’d read before this year was his guide to the craft, On Writing. I’ve had several friends recommend his fantasy, however, so I finally took the plunge, shortly after arriving in Santa Cruz this fall. I’ve read the first four books of The Dark Tower series thus far (inhaling them, one after the other), and I have to say that I’ve enjoyed them all. It is the first one, however (which many cite as the most difficult of the series to enjoy), that I absolutely loved. It is terse and sparse (much like the man, and landscape, it describes), and I was blown away with how much King does with how little. A piece of art. Runners up: The Remains of the Day by Kazuo Ishiguro (one of the most brilliant executions of tone I have ever encountered), Generosity: An Enhancement by Richard Powers (stylistically masterful and not quite like anything else I’ve read), Kafka on the Shore by Haruki Murakami (strange and haunting, even if somewhat incomplete in narrative), and Lonesome Dove by Larry McMurtry (essentially a thousand or so pages of character study — yet every word delightful). Phyllis Trible’s Texts of Terror: Literary-Feminist Readings of Biblical Narratives. This is a fairly technical piece of biblical scholarship, yet it would still top my list of books I’d recommend from this past year. Even beyond the powerful treatment of its content (which grapples with violence against women in the pages of the Old Testament), I loved this book for how it engaged with scripture. For the care and respect it gave the living text — the attention it paid to the mechanics of syntax and structure. Trible is a scholar who understands that respecting a text means questioning it, wrestling with it, demanding answers of it — and then trusting it to speak for itself. Runner up: Jhumpa Lahiri’s In Other Words. A unique and powerful exploration of language, exile, and identity. And Sigrid Undset’s Stages on the Road. A fairly uneven collection of essays, yet it has stayed with me in the subsequent weeks and months. Stephen King with the first four books of his Dark Tower series and Marrisa Meyer with her Lunar Chronicles (though, in pages read, Stephen King wins out by far). Runners up: Pierce Brown with his Red Rising trilogy and Jan Karon with the first three books of her Mitford series. Kevin Roose’s The Unlikely Disciple. Though I prefer avoiding this category whenever possible, I’m afraid Roose’s book earned it. While the premise (a Brown University student spending a semester undercover at Liberty University) might be intriguing, Roose (or perhaps Liberty) does no justice to the complexities of faith or culture that such an exchange should elucidate. There are many people I deeply respect who recommend this book, but I personally found it maddening and not enlightening. And couldn’t help feeling that Roose (and perhaps Liberty) had utterly missed the point. You can find a complete list of my year’s reading here or follow me on Goodreads for an up-to-date record of my reading, rants, and reviews. Okay, your turn: What were the best books you read in 2018? What did you love about them? Any reading goals for 2019? I realize that I am lagging terribly behind in updating anyone on my life. Failing to post for half a year is a woeful state of affairs — and one that I hardly have an excuse for (especially since I was writing an average of 1,000 words daily for a few of those months). Regardless, it’s 2017, the U.S. has a new president, a new semester has begun, and it’s time to take stalk of the year’s reading. Having read 44 books and 12,441 pages (which averages out to more than 1,000 pages a month — not quite sure how I pulled that off), I would say that 2016, when measured in reading, can be counted a success. A success kickstarted by the first book of the year (which, at 795 pages, was also the longest): The Brothers Karamazov (a quiet Christmas in Budapest, it turns out, is just what a reader needs). This was the year I crossed a few important must-reads off the list (The Brothers Karamazov, The Silmarillion, and Beloved, along with Eloise Montgomery’s Emily series, Lloyd Alexander’s The Chronicles of Prydain, and more), re-read a few favorites (mostly for the Inklings class I co-taught this past fall), and discovered, rather inexplicably, classic sci-fi (and what a discovery it was!). All in all, not a bad year. Elizabeth Peters’ Night Train to Memphis. No, this is in no way as good as Peters’ Amelia Peabody novels. However, it was delightful in its own right (and it doesn’t hurt that it’s dotted with Peabody references for those in the know). Runners up: Eloise Jarvis McGraw’s Moorchild (which has been on my to-read list forever; she’s been a favorite author since I was in grade-school) and Katherine Applegate’s The One and Only Ivan (loaned and recommend by one of my students). Krista Tippett’s Becoming Wise: An Inquiry into the Mystery and Art of Living. As I wrote on Goodreads, one of the wisest, most hopeful, and most inspiring books I’ve read in a long time. I highly recommend the audio version, which is peppered with excerpts from her podcast interviews. A brave and beautiful book. Runners up (nonfiction): An Altar in the World by Barbara Brown Taylor (a simple and beautiful reminder of the sacredness of our own lives, our own living) and Neil Postman’s Amusing Ourselves to Death (an AP Lang requirement, but thought-provoking and worth the read). Runner up (audiobook): Brene Brown’s Men, Women, and Worthiness: The Experience of Shame and the Power of Being Enough. I listened to many excellent audiobooks this year, but Brown’s voice, speaking her own words, ultimately makes this a cut above the rest. J.R.R. Tolkien’s The Silmarillion. Hands down one of the most beautiful things I have ever read. Runner up: Wendell Berry’s Hannah Coulter. A gentle, beautiful book about living well. Lloyd Alexander, with 5. His Chronicles of Prydain were the highlight of spring break. 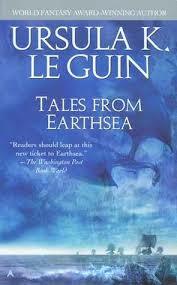 Runner up: Ursula K. Le Guin, with 4. Her Annals of the Western Shore were the highlight of the fall. Charles Williams’ The Place of the Lion. Almost a decade since my first read-through, and his books still burn. Runner up: Humphrey Carpenter’s The Inklings. The book that first introduced me to the Inklings as a community (rather than a disconnected handful of beloved writers). It was, and is, love at first sight. As my most read genre this year, it seemed only fair to give this its own category. My favorite single piece would have to be Hyperion by Dan Simmons. Atmospheric, terrifying, and littered with literary references. Lovely (though I didn’t care for the sequel). Runners up: Isaac Asimov’s I, Robot (which, as a collection of interconnected short stories, was not what I was expecting but was far more perfect) or anything by Arthur C. Clarke, whose work has yet to disappoint — specifically, 2001: A Space Odyssey is actually as good as it’s cracked up to be. You can find a more complete list of my year’s reading here. One of my goals for 2015 was to invest more in my own reading. And I seem to have done just that. Despite what felt like whole months of reading not at all (November, mostly), I still managed 42 books, and almost 11000 pages (10894, to be exact). It was a year of non-fiction (due, mainly, to teaching AP English Language and Composition, and wanting to consciously engage out of my own reading and thinking and learning), with just over 40% falling into that category (including, rather tellingly, almost all of my highest rated reads of the year), and it was a year of audio books (being able to simultaneously read AND shop, cook, do dishes, stretch, etc., is a wonder) — I owe almost half of the year’s reads to my iPod and the setting that allows one to listen to books at x2 speed. Runner up: Holly Black’s Doll Bones. I’ve long enjoyed Black’s imagination, but this was in a league of its own. Her propensity for Gothic horror, handled with a subtle and masterful touch. Bridge to Terabithia-esque, but (dare I say it?) better. A book about friendships, magic, and growing up. Dorothy Sayers’s The Mind of the Maker — Metaphor, theology, literary criticism: this book is an example of thinking at its most creative. Thought-provoking and interesting. I want to read it again. Annie Dillard’s An American Childhood — This is a book I wish I had written. Despite the difference in our worlds, she somehow captures all the unnamed truths of childhood and reveals them to me anew. Runners up: C.S. Lewis’s A Grief Observed and Joan Didion’s The Year of Magical Thinking. Both, in their way, love letters. Chimamanda Ngozi Adichie’s Americanah — A thought provoking and enjoyable story, well told. Runners up: Margaret Atwood’s Moral Disorder and Other Stories (an excellently crafted narrative; not so much a collection of short stories as a fragmented whole) and A.S. Byatt’s Possession (a complexly woven, enjoyable tale). The Autobiography of Mark Twain — Simply excellent. It felt like it lasted a lifetime (in the best way possible). The hugeness of the character (and life) housed therein was staggering. Like the Tardis, bigger on the inside. This was also the year that I discovered Librivox recordings. Far from imperfect, but freely accessible (and without which I never would have encountered Elizabeth Gaskell’s The Grey Woman). Flannery O’Connor with 3. Each one torturous, powerful, and tinged with grace. Some of the most memorable reading of the year. Runners up: Karen Blixen and Rainbow Rowell, each with 2. Ernest Hemingway’s The Sun Also Rises — I detested it fairly strongly while reading, but it’s truly grown on me in retrospect. A masterpiece in the marriage of form and content. There are few things that sum up a year for me more completely than the books I encountered within its confines. Since spending more time reading is one of my main goals for this coming year, I was slightly surprised to realize that I’d read 36 books last year (not counting books re-read) — not a huge amount, by any means, but not too shabby, either, when considering I’ve been teaching full time since the summer, and was working two jobs in the spring. 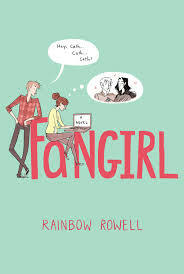 Rainbow Rowell’s Fangirl — This was somehow utterly perfect. A book about writing and reading. About fantasy and escape, and growing up and facing our lives. It made me want to write, and create, and live. 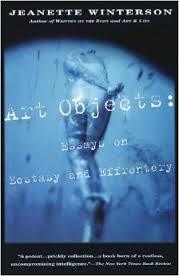 Jeanette Winterson’s Art Objects — A book about writing and art that pierces and burns and inspires. Neil Gaiman’s The Ocean at the End of the Lane — A strange and haunting tale about growing up, and all the things we forget along the way. 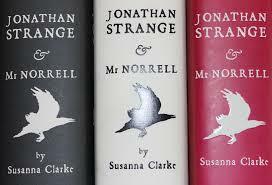 Susanna Clarke’s Jonathan Strange & Mr. Norrell — I never wanted it to end, and it felt like it never would. T.S. Eliot’s Murder in the Cathedral — A powerful explosion of language. Colorful and vibrant and piercing. Ursula K. Le Guin with 7 (The Earthsea Cycle and The Left Hand of Darkness) — Her books were certainly a highlight, especially The Wizard of Earthsea, The Tombs of Atuan, and Tehanu. I’d have to say it’s about a tie between Veronica Roth’s Divergent (which lacked any vibrancy of language, and which was forgotten as soon as read) and Orson Scott Card’s Enchantment (the premise of which I adored, but the execution of which was inconsistent, sloppy, and mediocre). If you’d like to check out all my reads from the year, you can visit my goodreads page, here. Books on my to-read list for 2015 include Jeanette Winterson’s Oranges Are Not the Only Fruit (which I’m one chapter away from finishing), Dostoyevsky’s The Brothers Karamazov, and just about anything by Sigrid Undset, though I especially have my eye on The Master of Hestviken, her biography of Catherine of Sienna, and Stages on the Road.